The Landsat Program is the longest running enterprise for acquisition of imagery of the earth from space. The first Landsat satellite was launched by NASA in 1972. The most recent, Landsat 7, was launched on April 15, 1999. The instruments on the Landsat satellites have acquired millions of images. These images are a unique resource for global change research and applications in agriculture, cartography, geology, forestry, regional planning, surveillance, education and national security. Today, Landsats 5 and 7 "see" and record blue, green, and red light in the visible spectrum as well as near-infrared, mid-infrared, and thermal-infrared light that human eyes cannot perceive (although we can feel the thermal-infrared as heat). Landsat 7 images have a spatial resolution (pixel size) of 15 m in panchromatic mode, 30 m in multispectral mode and of 60 m in the thermal IR channel. Find out more about the Landsat program history here. 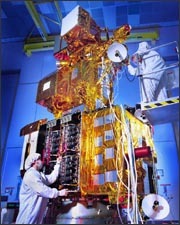 Landsat 7 satellite in the cleanroom prior to launch. Photo: NASA/GSFC.